The Hat People is renowned for its selection and quality, and ship their hats all over the world! From high style wear to active sports wear, the diverse collection of headwear will suite any occasion. A truly stunning addition to our historical line, 5 years in the perfecting. Completely handmade of the finest oiled moccasin cowhide. Complete with a full suede under trim and matching suede hat band. Snaps up on right side to clear your sword arm. Satin lining included with a full comfort plus sweat band. Brim witdth 4 1/4” each side. 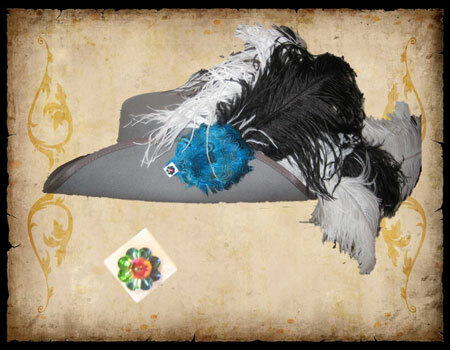 Two colors complimenting ostrich plumes slipped into a leather holder under brim. Sizes: 6 7/8 - 7 (small), 7 1/8 (medium, 7 3/8 Large, 7 5/8 (x Large). * Only available in in black or Gray at this time, no other colors are available. * Both colors are available in high or low crown styles. - Beige, Chocolate, Khaki & Black - Aussie sizes run small, order one size larger. - Satin Lined 100% extra thick virgin wool. Extremely Limited Quantities and Sizes! Since the last century we have carried a fine assortment of Panama Hats...Pictured above are a Ladies Rolled Edge Genuine Panama Bowler (to the far right) and 3 variations of the Callanan ''Panama Bette'' with a 4'' rolled brim trimmed with a Raffia Straw Band. One Size, specify stone or crystal trim. Soft Western with "U-Form-It" wire in brim.